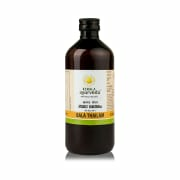 Kerala Ayurveda BalaThailam is an ayurvedic oil which is used in ayurvedic treatment of Vata diseases, vomiting, cough, cold, asthma, wound, emaciation. There is no recorded any side effects with this medicine. People with high BP and cholesterol should exercise precaution while taking this medicine. A licensed pharmacy from your nearest location will deliver Kerala Ayurveda Bala Thailam. Once the pharmacy accepts your order, the details of the pharmacy will be shared with you. Acceptance of your order is based on the validity of your prescription and the availability of this medicine.